Rahul Dravid has broken finger of his right hand.He was hit by the Brett Lee's delievery in 24th over of Indian innings.Lee hit Dravid on the middle finger of his right hand with a short ball and Dravid has had to retire hurt.It was a big blow for Indians at that instant of time but Sehwag proved it wrong. Dravid hasn't been included in India's one-day squad for the CB series and is expected to be fit for the home series against South Africa, starting in March. Dravid couldn't grip his bat too well after the injury and, after receiving regular treatment from physio John Gloster, decided to leave the field in what will probably be his last appearance in Australia. He was taken for an X-ray soon after and spent the day using ice-cubes to heal the finger. A final report it awaited but he is unlikely to be ready for action before at least another couple of weeks. 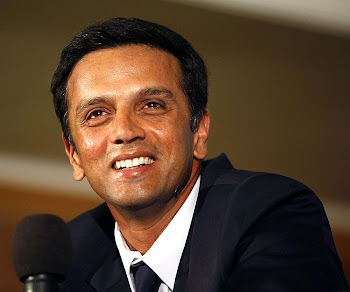 Dravid will have to keep himself away from cricket for atleast 2-3 weeks,according to the physio.